Most people, including a few interiors designers, have clichéd ideas about designing a kid’s room. Just paint the room pink (if it a girl) or blue (if it is a boy), throw in some toys, draw some cartoon characters on the walls and stick some stars on the ceiling - and it’s all sorted! Well, we’ve got news for you folks - that doesn’t work anymore! Designing a kid’s room takes as much planning as any other part of your home. It’s important to consider that children spend a lot of time in their rooms, sleeping, playing, studying or working. And of course, that they get bored rather easily! A kids’ room thus has to be an enticing combination of practicality and fun! Let’s see how this can be achieved. Things To Keep In Mind While Designing A Kid’s room! Before starting out on designing a kid’s room, some of the things to be kept in mind are the age of the child, along with his/her personality, hobbies and interests. As mentioned earlier, generic designs are passé! To design a space for two or more children, it is essential to add elements that reflect their individual personalities - in the form of accessories, bedding, furniture, colours, etc. Flexibility is important - choose designs that can be adapted to suit the kid’s temperament and requirements without too much of an overhaul as he/she grows. For smaller rooms, ‘less is more’ - cut down on the accessories and choose lighter shades to create the illusion of space. Wall mounted furniture makes a room appear more spacious – it’s all about being able to see under and around things that tricks the eye into thinking a space is bigger than it really is. How To Design A Room For Infants? A nursery should be a tranquil and timeless space. The ideal environment for an infant is one that exudes warmth, cosiness and a feeling of being protected. Choose a theme for the nursery - it becomes easier to choose colours, furniture and other elements that complement each other. Choose textiles and furniture before choosing the wall colours - it is important to ensure that the curtains, bedding, crib, storage, etc. complement the colour scheme of the room. The combination of subtle greys, soft pinks and white furniture is effortlessly stylish and ensures longevity to the nursery. Use a crib that has comfortable bedding and foldable railings. Avoid harsh lights - use dimmers, or better still, opt for accent lamps. Leave some room to grow - Plan ahead to make sure there’s enough space to replace the existing elements with those that might be needed as the child grows, for eg. replacing the crib with a toddler-sized bed. Baby-proof the room by covering electrical sockets, concealing wires, anchoring down furniture that might pose a threat, etc. How To Design A Room For Toddlers? This is probably the most difficult age. This is when kids try to crawl, run around, cartwheel, somersault and also pull out things from drawers. In other words, they are just beginning to explore their environment. It is important not to restrict their curiosity while making sure that they stay safe and don’t hurt themselves. Keep lots of open space for the child to run, walk and play. Avoid cluttering - focus on toddler-friendly storage options. Use stylish rugs to cover the floor - for times when the child might take a tumble! Choose furniture with rounded or curved edges. Use bright colours for the walls - choose elements like curtains and bedding that complement the colour scheme of the room. Kids at this age love to scribble on the walls - Create an ‘Art Wall’ by painting one of the walls of the room with chalkboard paint. Select toys that will improve the motor skills of the child and place them throughout the room. Use soft throw blankets on the bed for bedtime and cushions for casual lounging. Hang family photographs, pictures of animals, numbers, alphabets, etc. 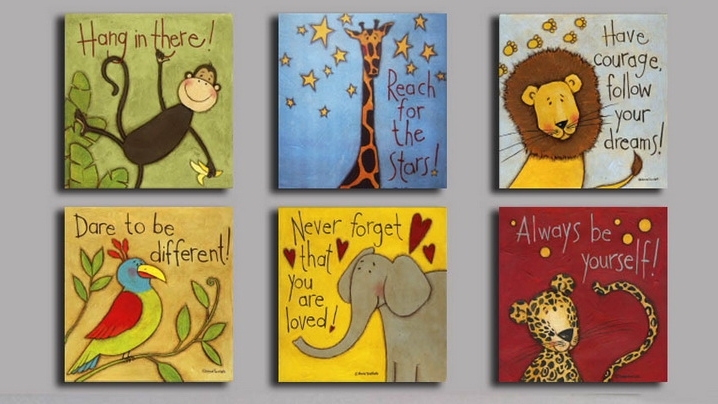 on the walls - this adds to the decor and also serves educational purposes. Alternatively, using wall decals also add a touch of colour to the room. How To Design A Room For Tweens/Pre-Teens? This is the age when kids develop their own likes and dislikes, therefore it is extremely important to involve them. Encourage children to have an input in the colour scheme or theme and contribute to how it is planned and arranged. This way, they are more likely to keep it organised and tidy. Make sure that all elements are arranged at reachable heights - baskets, trays, cupboards with doors and drawers are all good options. In case of plenty of space, try to push storage to the outer edges of the room so that children have a clearly identifiable place in which to play. Choose bright pastels and patterns for children - these help to keep the room bright and cosy. Invest in second-hand furniture painted in beautiful colours, colourful bed linen, key timeless decorative pieces that can be passed down, photos or artwork to reflect their personalities and loads of storage. Design the room keeping in mind the interests and personality of the child. For example, if a child loves to travel, add a world map on one wall. Create a corner, ideally near the window, where the child can study - utilise natural light as much as possible! Include a few indoor plants to enhance the decor and add a touch of nature to the room. Make sure they are easy to care for. Have a separate pin-up board where the child can pin his/her class routine, exam time table, notices from school and also a few of his drawings. How To Design A Room For Teens? This is the final stage before children leave the nest. This is the age of rebellion and it is better to let them decide what they want. Let them be actively involved in the designing phase so that the room reflects their personality. This is the age when a good desk is a must. Choose one that complements the room’s colour scheme and other elements. Personal space is important as a teen, so add their own style by accessorising with a funky chair design, brightly patterned blankets and some colourful desk tidies. Have funky cushions, pen holders, lamp shades, quilts and other accessories. Focus on creative storage options - it is not uncommon for teens to start hoarding clothes, books and other material! It is necessary to keep in mind that every child is different, and a room should reflect this uniqueness. Designing a kid’s room would be a lot easier with an expert’s help! Get in touch with Hipcouch today! Newer Post10 Hacks To Make Your Home Look Glam! Older PostHere's How You Can Find The Best Interior Designers In Mumbai!